Actress Junie Hoang, who sued Amazon.com after her date of birth was posted on its Internet Movie Database (IMDb), has had her claim rejected by a jury in Seattle. IMDb argued it had the right to publish accurate data and that Junie Hoang, 41, could not prove she lost out because of it. According to the website, Junie Hoang credits include the 2011 title Gingerdead Man 3: Saturday Night Cleaver. IMDb, which was launched in 1990 and purchased by Amazon in 1998, continues to post Junie Hoang’s date of birth on her profile page. In court documents filed anonymously in 2011, Amazon and its movie database subsidiary were accused of breach of contract, fraud, violation of privacy and consumer protection laws. Parent company Amazon was dismissed as a defendant before the two-day trial, which concluded on Thursday. The database’s stance drew criticism in 2011 from two acting unions, who accused the site of “facilitating age discrimination”. During the trial, though, the site’s attorneys said IMDb was not responsible for the actions taken by people who read their profiles. 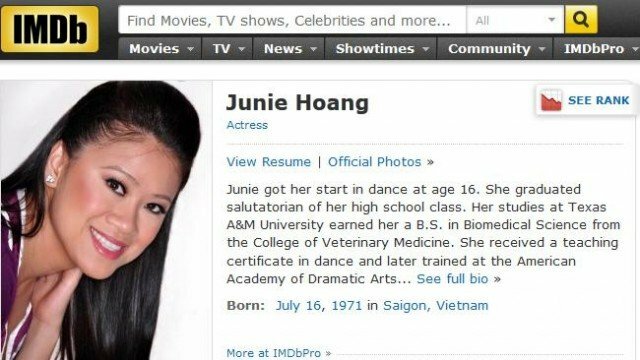 Junie Hoang, who had been seeking $1 million in damages, had initially provided IMDb with a false birth year that reduced her stated age by seven years. When the actress asked for that information to be removed, IMDb used a public records search to discover her true date of birth and published it against her objections. Speaking after the trial, Junie Hoang said she had hoped to make the database change its policy. “I knew it was a problem not just for me but for anyone else who had their age on their profile,” she told the Associated Press.